This is another great product from the DeWalt circular saw stable. This has similar features to many other corded DeWalt saws, but the DeWalt DWE575SB’s speciality is it’s weight as revealed in this DeWalt DWE575SB review. It’s specifically built to be lightweight, coming in at a mere 8.8lbs which is a good 3.5lbs lighter than say the very similar DeWalt DW364 which we reviewed earlier. That’s quite a bit of difference and will go a long way towards ensuring you don’t get tired hands and arms, or ensures you can go on cutting for a lot longer. It has a slighter lower speed than the DW364, coming in 600rpm under at 5,200rpm. That may make for a slightly slower cut. The cutting depth is slightly better, in fact it’s described as ‘best in class’, at 2-9/16″, which again if we compare to the DW364, is an 1/8″ deeper. That can make all the difference when you need it. Let’s now look at a few of the DeWalt DWE575SB review features in a bit more detail, certainly those which get mentioned by users most often. The electric brake is the first of those. This feature means that when you release the power switch, the blade stops spinning very quickly. This has two benefits; one, you get to keep all your fingers; and two, you can line up the next cut and start very quickly without waiting for the blade to stop spinning. This is a great time-saver when cutting multiple timber pieces you’ve already marked for cutting. In line with all other sidewinder circular saws, this model will make bevel cuts, ie cuts through lumbar at an angle. The DWE575SB makes up to a 57° bevel cut, significantly more than similar models, so you’ve got got a bit more flexibility with this tool. It has the usual stops at 45° and 22.5° to make easy adjustments for the popular cuts. There’s an aluminum shoe for lightweight operation and friction-free sliding. In addition there’s an integrated dust blower so you can see the cutting line clearly. If you’ve ever used older types of circular saws, or even more modern ones which don’t have this feature, you’ll know how useful this is. Constantly using my breath to blow away the sawdust covering the cutting line has long been one of my frustrations with these types of tools. No more! This DeWalt DWE575SB review has identified that the manufacturer appears to have introduced a carry case, or ‘contractor bag’ as they like to call it, instead of a rigid carry case. I have no real comment on this. Some people seem to like it and I guess it’s better than nothing at all. Finally there is on-board storage for the blade wrench, so that you don’t lose it! 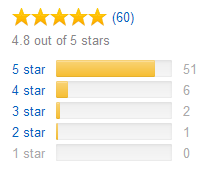 51 out of 60 users gave this tool 5 stars which is very high praise indeed. The last comment from a DeWalt DWE575Sb review above has an excellent point which I’ve highlighted before. You need to use the right saw blade for the right job, and that will make your life so much easier! I’ve seen too many comments where users are clearly not using the right blade and making it hard for themselves. So here we come to the usual comments – there is a ‘not brilliant’ saw blade supplied as usual with this saw. Use the one supplied for a couple of routine jobs, ones that don’t require a clean unsplintered cut, and then get rid of it. Buy a decent range of saw blades and don’t buy cheap please! You’ll just be wasting your money. The saw blade featured to the left here is a 60T (60-tooth) saw blade that produces a fast and clean cut, without splintering the front surface which is perfect for wood that’s going to be on show. Click the picture for more details, discounted pricing or to order. There’s a few of the ‘no rip guide included’ comments as usual. It seems crazy that for the almost insignificant cost of this accessory, for DeWalt not to include it and get more customer satiisfaction. 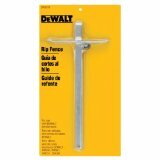 Never mind, here’s a link to the DeWalt rip guide or rip fence that will get you sorted. It costs very little and will help with many of your smaller jobs. Click the picture for more details, pricing or to order. 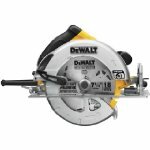 I hope you found this DeWalt DWE575SB review useful. It would be great if you’d drop me a line and say how you got on. If you are looking for DeWalt DWE575SB parts, you’ll find them at this link. You can download the DeWalt DWE575SB review & manual here if you want to look over the features, usage and specs before purchase (it’s in English/French/Spanish). 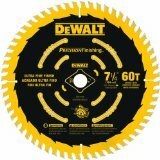 Curtesy of the DeWalt DWE575SB Circular Saw Review. How Do You Sharpen a Circular Saw Blade? That's fairly easy using just basic tools you have at home. You'll need a vice and a flat file. If your vice face is bigger than the width of the saw, use a couple of blocks of wood that are narrower than the saw blade - the point is you should never clamp the teeth of the saw in the vice (the teeth are slighly angled, so you'll flatten them).